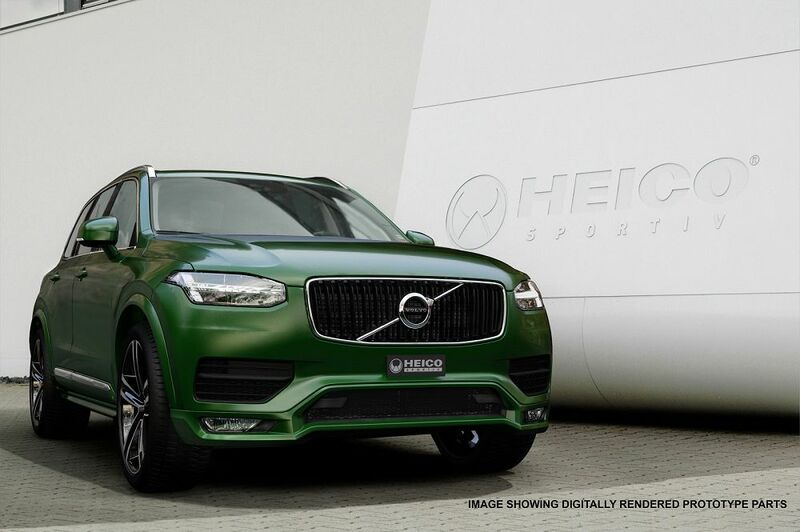 The art of design – Made in Germany: the Volvo XC90 BodykitSince time immemorial, HEICO SPORTIV’s exterior components have been characterized by an independent and expressive design. 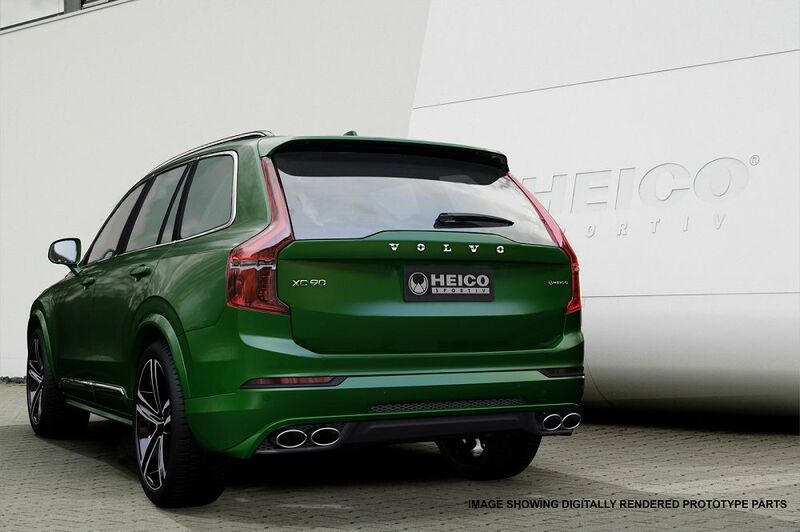 The HEICO SPORTIV rear skirt can be combined with the standard end muffler or, optionally, with the HEICO SPORTIV exhaust system and/or Selected Sound. To shorten the time to market and ensure the snuggest possible fitting, all parts were constructed using computer aided design (CAD). Plug & play interchange techniques are universally used to replace the original parts, and each component is compatible with all the various design options (i.e. Kinetic, Momentum, Inscription and R-Design). The components also come with a registration-free general operating license (ABE) including pedestrian protection testing. Selected Sound is a HEICO SPORTIV-developed sport exhaust system with integrated subwoofer. With a HEICO SPORTIV e.motion® controller, vehicle-relevant data – such as speed, rpm, load status and accelerator position – are forwarded from the CAN-BUS to a sound processor with amplifier to generate the V8 Sound specially developed by HEICO SPORTIV’s technicians. Drivers can choose between standard, unobtrusively sporty and pure V8 sound pleasure. The standard configuration is compatible with the series-produced rear skirt with trapezoid tailpipes, or optionally with the HEICO SPORTIV rear skirt and four tailpipes. Selected Sound will initially only be available for the VEA T6 engine, but further variants – also with EC type approval – will become available for other VEAs over the medium term. For a perfect show: new 22” and 23” sport wheels for the Volvo XC90Where Volvo’s offering ends, HEICO SPORTIV’s is only just starting. HEICO SPORTIV’s engineers decided on the dimension 11x23” for the forged wheel as an optimal compromise between maximum size and best suitability for every-day use. With that, HEICO SPORTIV offers a wheel size that’s 1” larger than the maximum offered by Volvo. Despite the forged wheel’s impressive size, it was possible to realize a massive, circa 15% weight saving compared to the conventional cast wheel. The aluminum is compacted in the so-called forging process prior to the actual production step. This improves the material’s stress-bearing qualities, and filigree design requirements can be implemented. Finally, the forged wheel’s form is milled from the aluminum block on an ultra-modern 5-shaft high-speed cutter, mirror polished, and finished with an acrylic lacquer. The substantially lighter wheel rims reduce the unabsorbed mass, thereby resulting in a significantly more pleasing driving experience. The design captivates with ten clear-cut, elegantly curved spokes that melt away deep inside the rim well, giving a highly filigree, stylish look. The VOLUTION® X. FORGED 11x23” forged wheel can be optionally delivered with 315/25 R23 ContiSportContact 5P tires and will be available from August 2015. Another attractive alternative to Volvo’s standard portfolio is the VOLUTION® V. 22” sport wheel – an evolved version of the classical VOLUTION® V. wheel with its timeless five-spoke design. In the new interpretation, the spokes have a distinctly concave form, giving the wheel an even more dynamic and wider appearance. Technical highlights include undercut-milled spokes and manufacturing using a low-pressure casting process for weight reduction. The VOLUTION® V. 22” sport wheel is perfected with 285/35R22 tires and delivered in Black Diamond Cut and a warm titanium color tone. 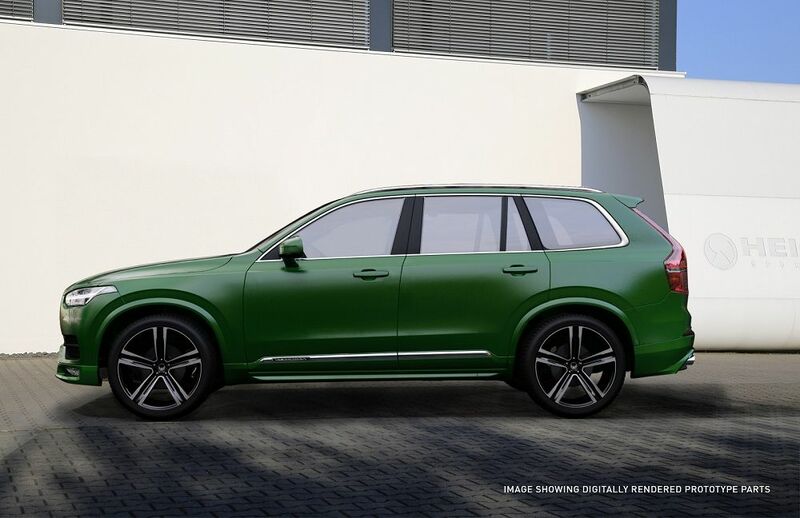 Complete program: HEICO SPORTIV fulfills every desireBesides these product novelties, HEICO SPORTIV also offers a holistic individualization program for the new Volvo XC90. This includes e.motion® performance enhancements for D4, D5, T5 and T6 engines, exhaust systems, lowered suspension and bespoke leather finishing of the interior. 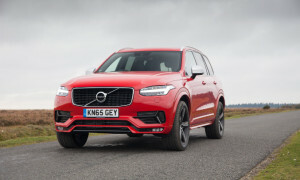 “With this portfolio, we’re delighted to offer products which appeal to interested Volvo XC90 customers”, concludes Holger Hedtke.